1997-06-05. New. Ships with Tracking Number! INTERNATIONAL WORLDWIDE Shipping available. Buy with confidence, excellent customer service! 2004-08-06. New. Ships with Tracking Number! INTERNATIONAL WORLDWIDE Shipping available. Buy with confidence, excellent customer service! HARPERCOLLINS PUBLISHERS LTD. Hardcover. 004306003X Like New Inside & Out. Clean & Crisp! No markings. You will be pleased. Excellent book! ( z1s78C ) Some very minimal shelf wear on dust cover. ** Fast Shipping! ** . Fine. Scribner. Paperback. 0684843285 Please allow 4 - 14 business days for Standard shipping, within the US. Thank you for supporting our small, family-owned business! . New. 1997-02-01. Reprint. Scribner. Paperback. 0684843285 Please allow 4 - 14 business days for Standard shipping, within the US. Thank you for supporting our small, family-owned business! . Fine. 1997-02-01. Reprint. Scribner. Hardcover. 0684181320 New Condition *** Right Off the Shelf | Ships within 2 Business Days ~~~ Customer Service Is Our Top Priority! - Thank you for LOOKING :-) . New. Scribner, 2004. Hardcover. Very Good. Disclaimer:A copy that has been read, but remains in excellent condition. Pages are intact and are not marred by notes or highlighting, but may contain a neat previous owner name. The spine remains undamaged. At ThriftBooks, our motto is: Read More, Spend Less.Dust jacket in good condition. Second printing. SIGNED by the author. Minor shelf and handling wear, overall a clean solid copy with minimal signs of use. Dust jacket now wrapped with protective mylar cover. Light rubbing of jacket with a few smal ledge chips. Price-clipped front flap. Secure packaging for safe delivery.Dust jacket quality is not guaranteed. Scribner. Hardcover. 0684181320 Please allow 4 - 14 business days for Standard shipping, within the US. Thank you for supporting our small, family-owned business! . New. 1984-11-01. Scribner. Hardcover. 0684181320 Please allow 4 - 14 business days for Standard shipping, within the US. Thank you for supporting our small, family-owned business! . Fine. 1984-11-01. Scribner. Hardcover. B008250ZVO Very Good Condition. Five star seller - Buy with confidence! . Very Good. Scribner. Hardcover. 0684181320 New Condition. . New. Scribner. PAPERBACK. 0684843285 New Condition. . New. Consumers Union. PAPERBACK. 0890431663 New Condition. . New. Scribner. Hardcover. 0684800012 New Condition *** Right Off the Shelf | Ships within 2 Business Days ~~~ Customer Service Is Our Top Priority! - Thank you for LOOKING :-) . New. Consumers Union, 1988-01-01. Consumers Union ed. Paperback. Used:Good. HARPERCOLLINS PUBLISHERS LTD. Hardcover. 004306003X . Good. 2004-08-06. Good. Ships with Tracking Number! INTERNATIONAL WORLDWIDE Shipping available. May not contain Access Codes or Supplements. May be ex-library. Shipping & Handling by region. Buy with confidence, excellent customer service! Scribner. Hardcover. 0684800012 Please allow 4 - 14 business days for Standard shipping, within the US. Thank you for supporting our small, family-owned business! . New. 2004-11-23. Revised, Updated. Scribner. Hardcover. 0684800012 Please allow 4 - 14 business days for Standard shipping, within the US. Thank you for supporting our small, family-owned business! . Fine. 2004-11-23. Revised, Updated. HarperCollins Publishers Ltd, 1986. This is an ex-library book and may have the usual library/used-book markings inside.This book has hardback covers. In good all round condition. Dust Jacket in good condition. Scribner. Hardcover. 0684800012 Special order direct from the distributor . New. Collier Books, New York. PAPERBACK. 0044402775 ref 969 d . Very Good. 1988. 1984-04-02. Good. Ships with Tracking Number! INTERNATIONAL WORLDWIDE Shipping available. May not contain Access Codes or Supplements. May be ex-library. Shipping & Handling by region. Buy with confidence, excellent customer service! 1997-06-05. Good. Ships with Tracking Number! INTERNATIONAL WORLDWIDE Shipping available. May not contain Access Codes or Supplements. May be ex-library. Shipping & Handling by region. Buy with confidence, excellent customer service! New York: Charles Scribner's Sons. Fine copy in fine dust jacket. 1984. 1st. hardcover. 8vo, 684 pp., First printing of the first edition. .
Scribner. Hardcover. 0684800012 . New. Scribner. Hardcover. 0684800012 Remainder mark . Fine. Da Jia Chu Ban She, 2009-09-01. Paperback. Good. Consumers Union, 1988-01-01. Paperback. Very Good/Very Good. Very good hardcover in very good dust jacket. This book would make a great gift. Full refund if not satisfied. NY: Scribner. VG+/VG+. 2004. 1st revised pt. hardcover. 8vo . 883pp . Signed by the author on a blank label 2nd end paper. Very slight bow to cover. Light wear to DJ. .
Scribner. PAPERBACK. 0684843285 Like New Condition. . Fine. Consumers Union. PAPERBACK. 0890431663 Like New Condition. . Fine. Scribner. Hardcover. 0684181320 Like New Condition. . Fine. Scribner. Hardcover. 0684800012 Please allow 4 - 14 business days for Standard shipping, within the US. Thank you for supporting our small, family-owned business! . Fair. 2004-11-23. Revised, Updated. Scribner. Paperback. 0684843285 Please allow 4 - 14 business days for Standard shipping, within the US. Thank you for supporting our small, family-owned business! . Fair. 1997-02-01. Reprint. Scribner. Hardcover. 0684800012 BRAND NEW, GIFT QUALITY! NOT OVERSTOCKS OR MARKED UP REMAINDERS! DIRECT FROM THE PUBLISHER!|2.95 . New. Scribner. Hardcover. 0684181320 Please allow 4 - 14 business days for Standard shipping, within the US. Thank you for supporting our small, family-owned business! . Fair. 1984-11-01. New York: Scribners, 2004. Revised Edition. Hardcover. Near Fine/near fine. About As New in all respects. Completely revised and updated. From the flap: "On Food and Cooking pioneered the translation of technical food science into cook-friendly kitchen science and helped give birth to the inventive culinary movement known as "molecular gastronomy." Though other books have now been written about kitchen science, On Food and Cooking remains unmatched in the accuracy, clarity, and thoroughness of its explanations, and the intriguing way in which it blends science with the historical evolution of foods and cooking techniques.On Food and Cooking is an invaluable and monumental compendium of basic information about ingredients, cooking methods, and the pleasures of eating. 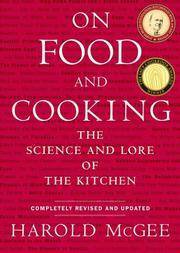 It will delight and fascinate anyone who has ever cooked, savored, or wondered about food." James Beard Foundation and International Association of Culinary Professionals award winner. Every effort is made to ship all books and other items within 24 hours. Clean recycled packing material will be used when possible. The Book Shed has a been a member of the Vermont Antiquarian Bookseller's Association since 1997. An online bookseller with a bookshop sensibility! New York: Scribner. Fine copy in fine dust jacket. 2004. Revised ed.. hardcover. 8vo, 884 pp. .